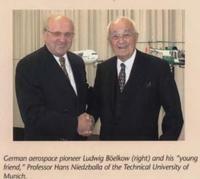 Former CEO of Messerschmitt- Bölkow -Blohmn GmbH (MBB), Ludwig Bölkow was regarded by many as Germany's greatest aerospace engineer. Under his leadership, MBB, a predecessor to the European Aeronautic Defense and Space Company (EADS), introduced trailblazing innovations for helicopters, fixed-wing aircraft and rockets. As early as 1957, Mr. Bölkow created the foundation for the company's successful collaboration with France's Nord Aviation, which later became known as Aerospatiale. Other ventures with British, Italian, American, Spanish, Dutch and Japanese companies followed. "Ludwig Bölkow believed in a technological Europe. He knew that to be competitive this continent must assume a leading role in aerospace and that the European nations can only achieve this through concerted actions," said EADS CEOs Rainer Hertrich and Philippe Camus. "First and foremost, however, Bölkow is one of the fathers of airbus," Hertrich and Camus added. Bölkow was a great innovator. At MBB he developed the hingeless rotor for helicopters (the BO-105 helicopter was named for him, as was the BK-117), control and attitude systems for satellites and small propulsion units for space systems. He was born in Schwerin, Mecklenburg on June 30, 1912. After practical training in aircraft construction at Heinkel Engineering, he studied at Berlin-Charlottenburg Technical University from 1934 to 1938. At Messerschmitt AG in Augsberg, he served as group leader for the Me 262 Jet aircraft and its successors. In January 1943, he became chief of the Me 109 development office in Vienna Neustadt. Returning to Messerschmitt project office 1944, he created the development program for the Me P1101 Swept-Swing Jet Fighter. Unlike many top engineers who immigrated to the United States following the war, Mr. Bölkow remained in Germany where he founded his own engineering bureau in Stuttgart. In 1954, he renamed his company Bölkow Entwicklunger KG and returned to aviation and defense technology. His first products were leisure aircrafts and missiles. He founded Bölkow GmbH in 1965, which merged with Messerschmitt AG in 1968 in to what soon became known as Messerschmitt-Bölkow-Blohmn GmbH or MBB. Under his direction, MBB developed into a major systems firm for aeronautics, space systems, defense technology, traffic systems and energy. In 1977, at age 65, he left MBB's management, but he remained active throughout his retirement years. During his lifetime he received numerous awards including the Grand Cross of the Order of Merit of the Federal Republic of Germany, the Bavarian Order of Merit, and the Bavarian Maximilian Medal for Science an Art.